FremantleMedia North America and producer Jeff Gaspin are set to launch an updated version of the classic panel game. Deadline.com announced today that FremantleMedia North America is teaming with producers Jeff Gaspin and George Moll to revive the classic game show To Tell The Truth. Eyed for a possible primetime network slot, the new version of Truth will be an “update of the familiar format with a surprising new twist that adds action and suspense and raises the stakes. 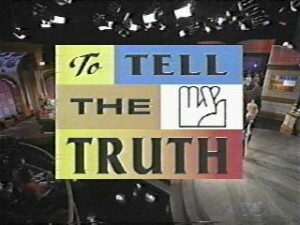 Originally hosted by Bud Collyer, To Tell The Truth premiered on CBS in 1956 and stayed on the air until 1968. The following year, Garry Moore took over as host of a syndicated version that lasted until 1977, by which time Joe Garagiola became host following Moore’s retirement. Another syndicated version ran in the early 80s hosted by Canadian personality Robin Ward. NBC revived the show in 1990 with hosts Gordon Elliott, Lynn Swann, and Alex Trebek. 2000 saw yet another syndicated Truth, hosted by future Family Feud host John O’Hurley. If the new version is successful in making it to air, To Tell The Truth will join The Price Is Right as one of the only two game shows in television history to air first-run episodes in seven consecutive decades. To Tell The Truth, along with the majority of the Goodson-Todman game show productions from the 40s through the 90s, are properties of FremantleMedia. The new Truth will be brought out to potential buyers shortly.